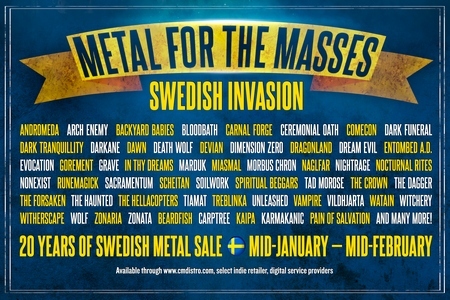 Metal for the Masses: Swedish Invasion! When it comes to heavy metal ‘scenes,’ one of the first that will come to mind is undoubtedly that of the Swedish scene. Whether it’s the buzzsaw crunch of the early Swedish death metal movement, the guitar harmonies (or later day modern experimentation) of the Gothenburg movement, or the emergence of a new generation of traditional metal, Sweden has always been a forerunner in the eyes and ears of many. In fact, list the first ten bands you can think of off the top of your head and you’ll realize how synonymous Sweden has become with the genre. Century Media Records is celebrating 20 years of Swedish Metal in 2015 with a special “Metal for the Masses: Swedish Invasion” promotion. Select titles from Swedish Century Media artists are discounted at digital service providers, retail outlets, and CM Distro.com from now until mid-February. Stock up on these classics today while you can! Given the chance to partner up with Century Media Records for this occasion, it was a chance to investigate what makes the small country such a hotbed for metal activity. Firing off questions to members of the scene from its various incarnations, we look at the past, present, and future of what Sweden has to offer. Read on…. Dead Rhetoric: What do you see as the real beginning to Swedish metal? Candlemass? 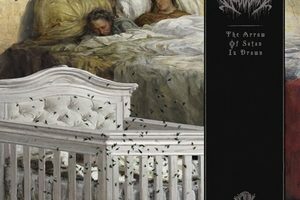 Tomas Lindberg (At the Gates): Well, we have a very long and proud tradition with heavy metal and hard rock in this country going as far back the seventies with bands like November and Kebnekaise. The eighties were especially grand with bands like Heavy Load, Silver Mountain, 220 volt, Mercy, Syron Vanes, Torche, Bedlam, Crystal pride, E.F. Band, Gotham City and Overdrive. Then came Bathory and changed the whole thing around completely – for me that was the biggest thing that has happened in Swedish metal history – their two tracks on the Scandinavian metal attack album turned everything upside down. Candlemass, Agony, Manninya Blade, Mezzrow, Damien, Ice Age, Virgin Sin, Mefisto, Midas Touch and later death metal with Nihilist, Morbid, Sorcery, Grave, Grotesque, Obscurity, Dismember, Merciless was great, but still Bathory was the thing! Niklas Sundin (Dark Tranquillity): I guess that there was a gradual development from the prog/heady rock of the 70’s, so it’s impossible to pick one band out as the sole pioneer. We got into metal in the mid-80’s, so Candlemass were definitely among the first Swedish bands that we discovered, but there were also Bathory, Heavy Load, Agony, Mefisto, Hexenhaus, Destiny and so forth. Niklas Stålvind (Wolf): I think the first metal band emerging from Sweden was Heavy Load, founded 1976. They were known for their Viking image and playing extremely loud. Among Swedish musicians today there is many stories about Heavy Load, which is a band not that well known among the mainstream metal fans but more so among musicians and fans of old school metal. Jonas Renkse (Bloodbath/Katatonia): Heavy Load! One of the first Swedish “real” metal bands to have an album out I believe. And then of course Bathory, Candlemass. A great foundation right there. Dead Rhetoric: Sweden has always done a good job of nurturing young musicians through after school programs. Were they helpful for you? Lindberg: Yes, they are called “circles for studies”, and are state sponsored but run by different voluntary groups. Basically you have to have organized meetings (which could be rehearsals for an example) and they help you with equipment and rehearsal room, rent, etc. (you have to show receipts of course). I think it´s a great way to “keep the kids off the street” so to speak. We have enjoyed lots of help from these kinds of organizations. Sundin: Yep, the welfare state nature of Sweden probably played a big role for the music (not only metal) scene here. We didn’t utilize much of that help ourselves, but for many years it was possible for any school kid with a music interest to get access to free lessons, equipment and rehearsal spaces. Stålvind: Very helpful for me, I must say. We had a rock band going on where I played the drums and the school provided equipment, teacher and rehearsing place. You could pretty much choose any instrument you wanted to play and you get help and could even rent instruments. I would have played music anyway, but it certainly helped to get easy access to rehearsal places and teaching. Renkse: Not for me personally, I took some guitar classes in third grade, but it was boring for someone who wanted to play metal… all we ever did was playing on one string on an acoustic guitar, a song called “Vargens sång” (song of the wolf). So I quit. Dead Rhetoric: What do you think is the most overrated aspect of Swedish metal? Lindberg: Melodic death metal? Haha… Honestly, I don´t know. It´s very hard to see these kind of things when you are on the inside of them. I really think we have a great climate, and a heartfelt relationship between the bands and between the bands themselves. Sundin: Tricky question. To me there never really was one stereotypically Swedish sound but always a multitude of different styles. But just to give some sort of reply: Maybe the fact that it’s so easy to form a band here also has lead to a lot of the music being too polished and focusing on technical skill rather than visceral intensity. Then again, there are a lot of grittier bands from here too, so it doesn’t apply to everyone. Stålvind: This new wave of traditional heavy metal that we pioneered. We were the first band and we were both celebrated and spit at when we came because we did something completely different and it was rather “wrong” to do it in those days, in the mid nineties. So we’re proud of having been said to paved the way for lots of other band and helping the genre get popular again, but that doesn’t mean that every album released in this genre is top notch. Renkse: I think “the Gothenburg sound” became a bit too popular, making a lot of bands sounding the same. Dead Rhetoric: On the flipside, the most underrated? Lindberg: Once again, hard to say when you are in the middle of things. but generally: the supportive atmosphere between the bands. Sundin: Not sure…on an individual level, there are always bands that one thinks are great and never get the recognition they deserve, but on the whole I’d say that the Swedish scene isn’t underrated at all. Stålvind: RAM. A great band from Gothenburg who came right after Wolf. They have a great Judas Priest vibe to them, but they totally have their own sound and they have always been as uncompromising as us.